A purchasing manager of any organization buys products to use and resale. They look after the process of evaluating the suppliers, negotiating contracts, and reviewing the quality of the products. They also look after the task of supervising the purchasing agents and buyers. You may also see Job Description samples. In small-scale organizations, they even play the role of a representative or buyer. 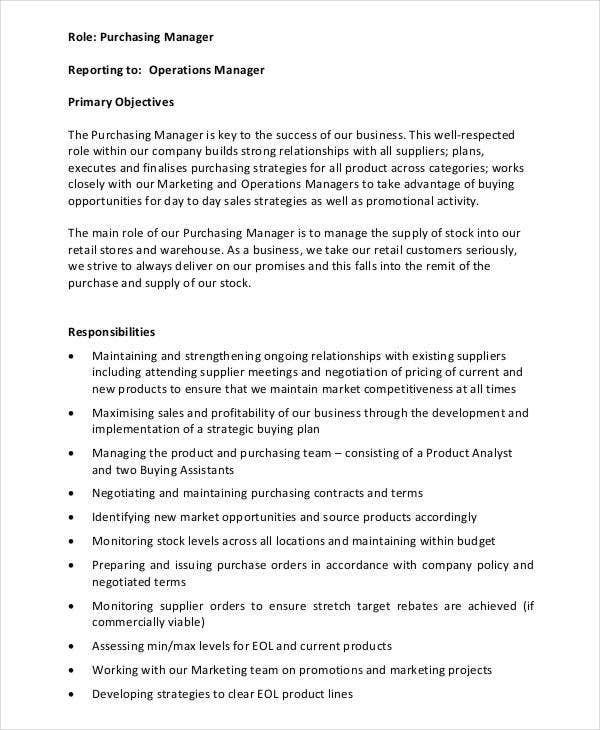 Given below is a list of purchasing manager job description templates which will put further light on the various roles and responsibilities of a purchasing manager. You can also see Sales Manager Job Description Templates. 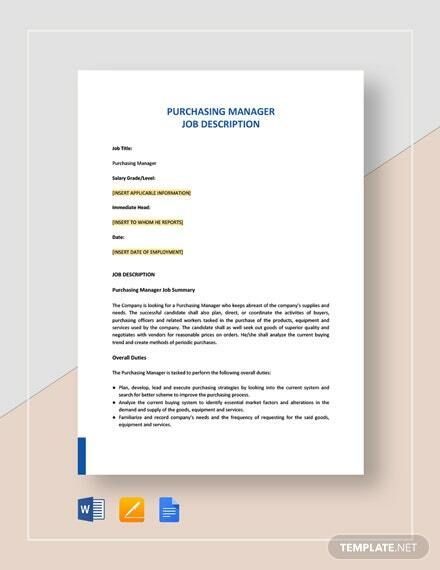 Purchasing Manager Job Description Template in PDF is an ideal template that includes various sections like a summary of the roles of a purchasing manager, essential functions, minimum qualification, license and certification requirements, and physical demands and working environment. You may also see the Financial Manager Job Description Templates. The above job description will be the perfect choice for you if you are looking for a purchasing manager for your logistic division. It explains the various needs like the specific attributes, skills, responsibilities and duties, and the key performance indicators which are crucial for this job position. 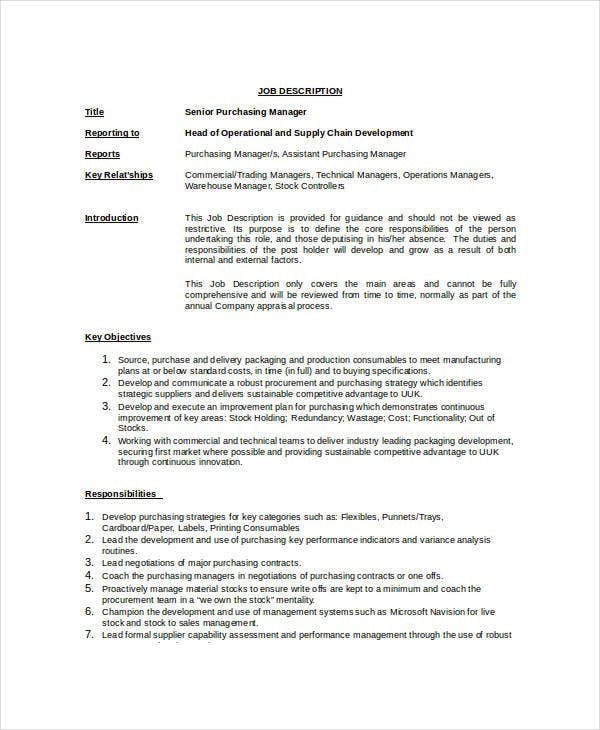 If you are looking to hire a candidate for the role of a Senior Purchasing Manager or if you are looking forward to applying for this job position, you should download this Senior Purchasing Manager Job Description Template in Word to get more details about the various roles and responsibilities required for the job. You may also see Job Description Templates in Word. 1. Why do you need these Purchasing Manager Job Description Sample templates? 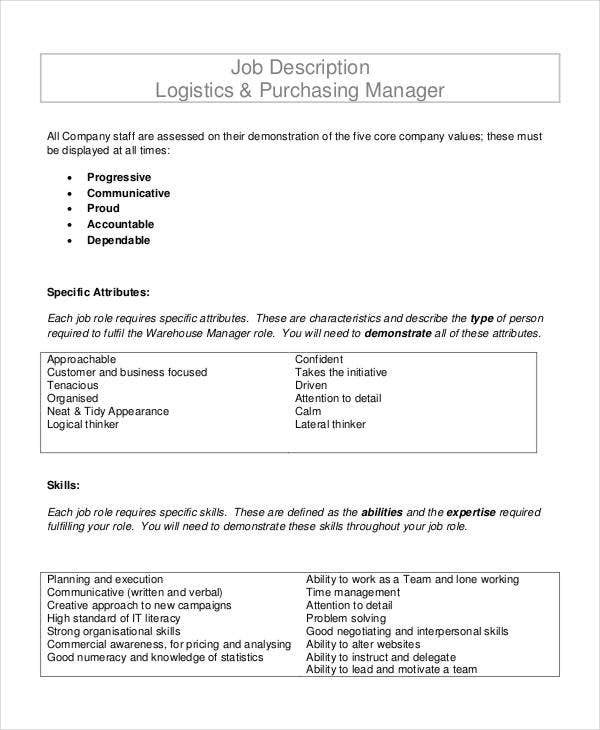 The Purchasing Manager Job Description Samples, as mentioned above, have been designed specifically for posting online job boards or career pages. They are effortlessly customized for your company’s requirements. They provide you with a readymade structure which you can use for your organization. And if you are a candidate and looking for a job in some reputed organization as a purchasing manager, these templates will offer you an in-depth insight into the various aspects of the job profile like the different roles and responsibilities that you will have to perform in the role of a purchasing manager. By going through these templates, you will be in a position to decide whether you are fit for the role or not. You can also see Marketing Manager Job Description Templates. Purchasing Manager Executive is a key contributor to the success of any business. They assist in building strong relationships with all suppliers. They plan, execute, and finalize the purchasing strategies for all the products across categories. 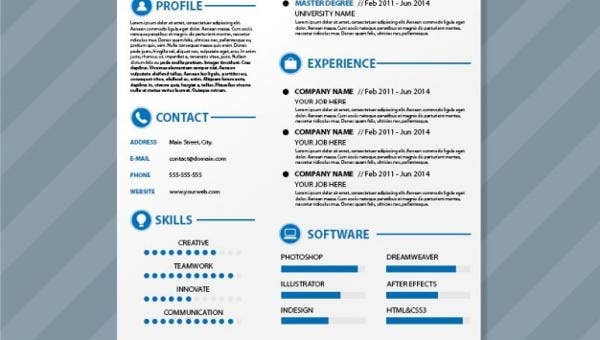 Use this template to craft an impressive job description. 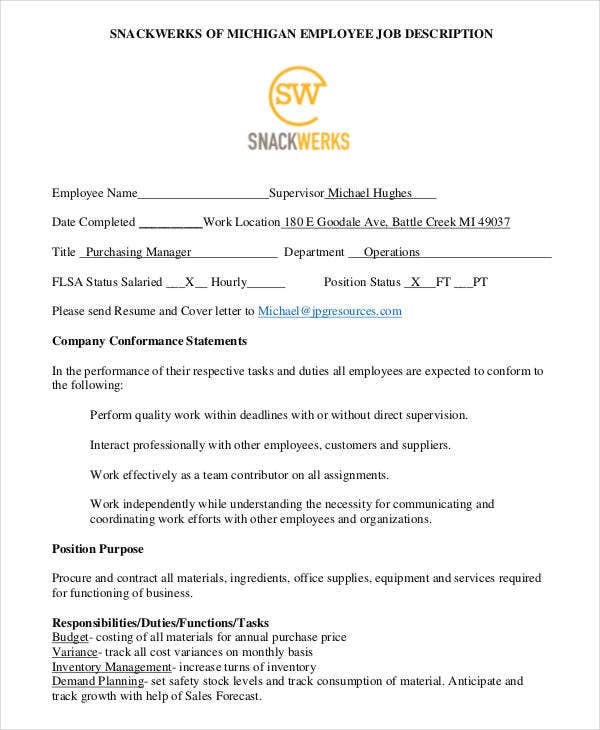 This SnackWerks Purchasing Manager Job Description starts with the details of the particulars of the candidate that also include his previous work experience and it is followed by the purpose of the job position, responsibilities/duties/tasks/functions, qualifications, and work requirements. 2. 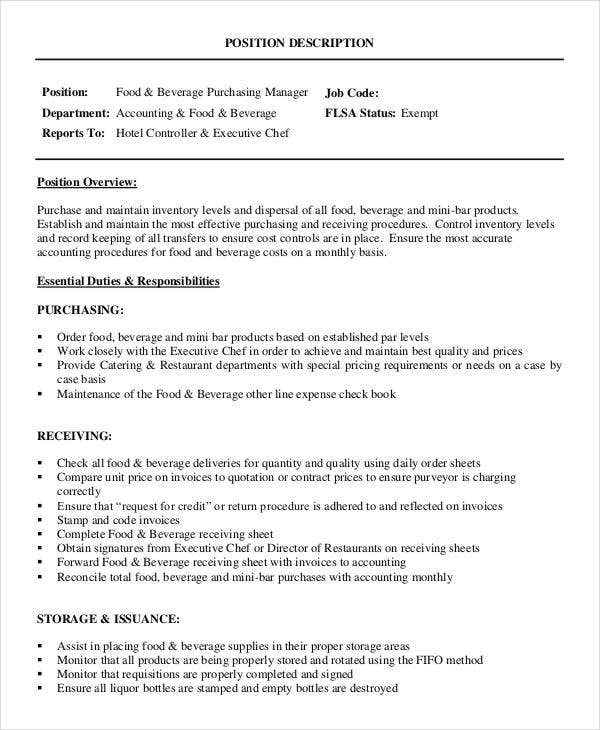 What are the benefits of using these Purchasing Manager Job Description Sample templates? 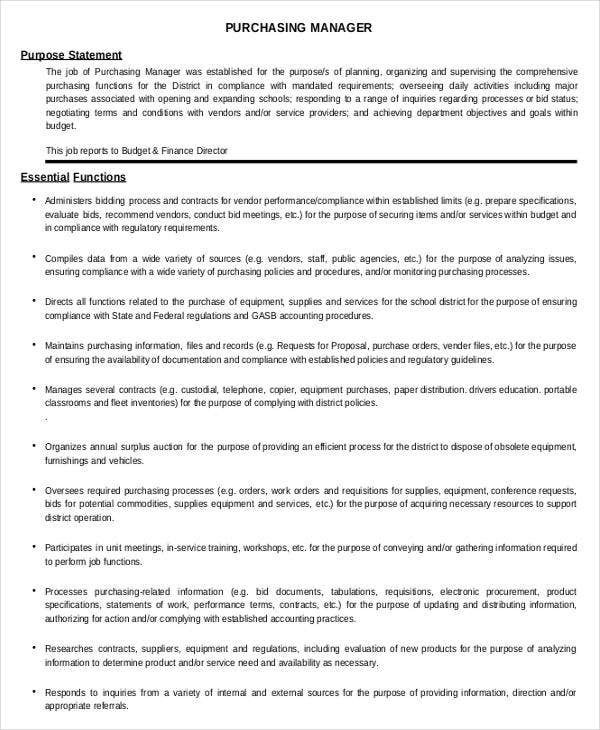 The Purchasing Manager Job Description templates will help you out with an overview of the job position, various responsibilities associated with the job, requirements for the job role, and the set of benefits that comes along with the job. The candidate will get an appropriate idea about the demands of this job position by going through the job description template and judge for themselves if they fit into the requirement for the job or not. And as a recruiter, if you have constructed a well-structured job position, you will not have to deal with candidates who are not suitable for the job role. So, it is a win-win situation for both the recruiters as well as the candidates. 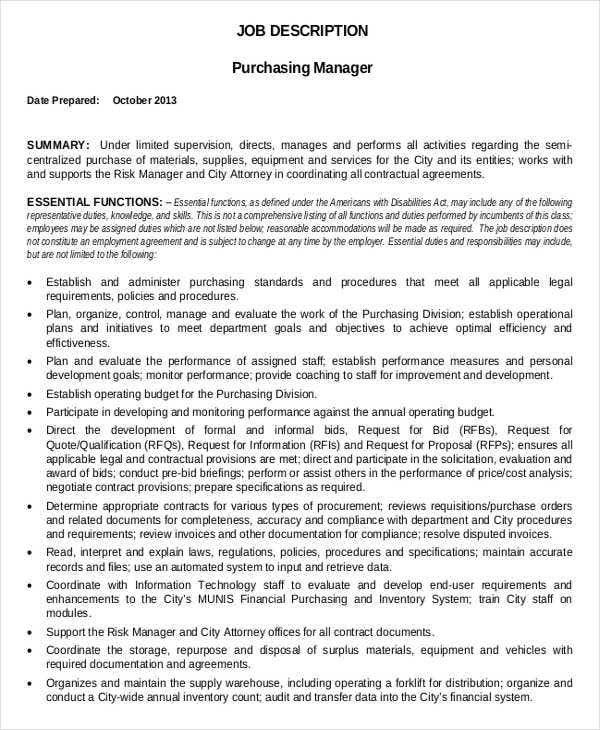 Are you looking for a Purchasing Manager Job Description Sample template that you can use? Don’t look any further if your answer is in affirmative. We have a vast collection of Purchasing Manager Job Description Samples on our website that you should go through and decide for the template that matches your requirement perfectly. Furthermore, these templates are fully editable. Hence, you can add further details to the template as per the need of your organization. Download the template, customize it, and take a printout. You will be ready with a well-crafted Purchasing Manager Job Description. 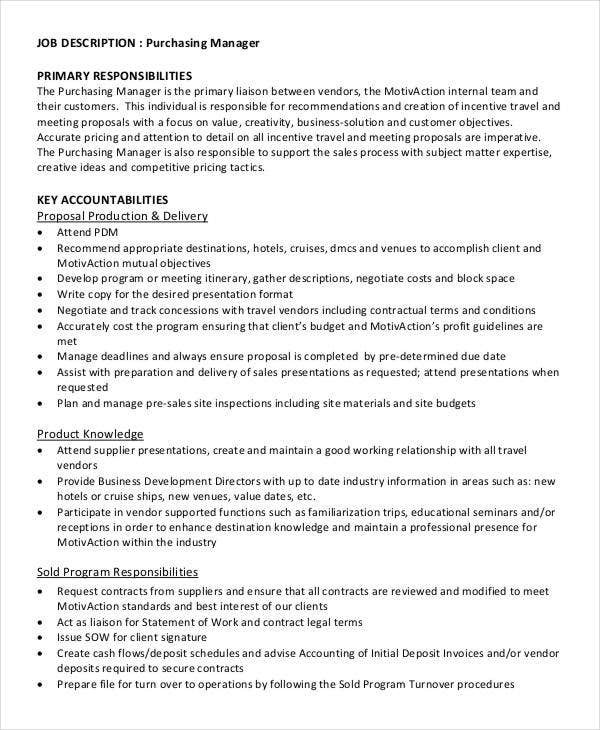 You may also see Sales Representatives Job Description.